Kim from I Tripped Over a Stone wrote this poem of strength to Fibromyalgia. 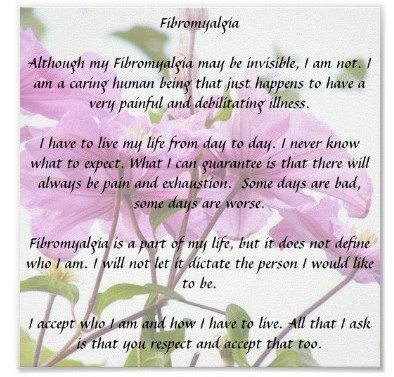 Please visit her blog for more of her Fibro journey told from her heart. 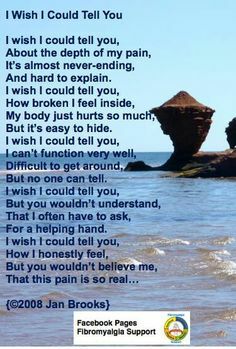 Fighting Fibromyalgia shared the poem below about Fibromyalgia asking for understanding. 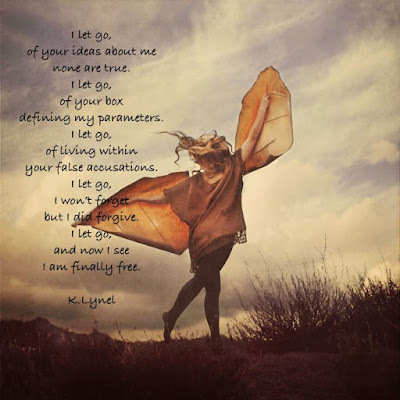 Please visit her blog for uplifting quotes and to read the poem clearly. 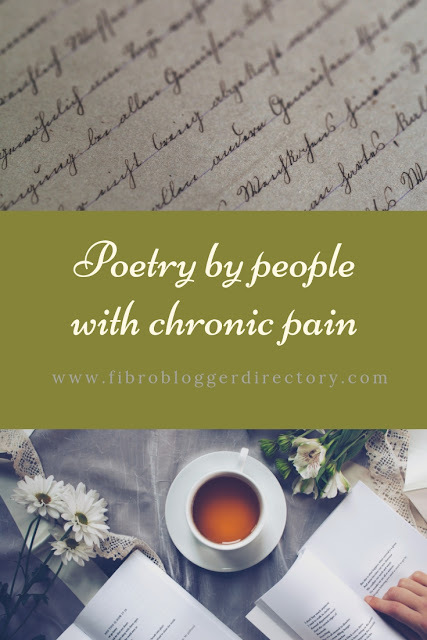 Nikki at Brainless Blogger wrote It Took about Fibromyalgia. (below) She has written other poems which you can read at her blog. Do you still want the same things? Are you still motivated and ambitious? Is this the same person that walked a half marathon? a mean and nasty foe. with love and joy divine! Visit her site to read the whole beautiful poem. That terrible pain you have and continually get. And you think, please stop now and give me a rest for a bit. My face has changed; my expression bare. This is my pain, that so many share. The smiles and joy that I once knew so well. Have vanished before me; a living hell. I see those who are active and those who can dance. I want those happy moments. I need hopeful plans. Is fatigue in my eyes, and a frown before me. Oh I try to push through. I can act for a bit. But my body still hurts, and my mind is still wrecked. But I’m tricked in believing my pain has been severed. The next day I wake, in the middle of the night. The pain is back in full, it’s a horrible fright. So I lay there hoping my mind will shut down. And pray it’s a dream. When I wake I’ll be found. While I suffer in silence with nothing to give. And despair comes a calling; it thinks it’s a friend. But I hate it and so want her visits to end. I know people all struggle, they mirror my pain. They mirror my expression, and that keeps me sane. but, that others can understand my longings and sighs. I’m going to fight this for more than awhile. I’m going to see in the mirror, my beauty that shines. I must let it out, my hopes must not hide. So it’s round one today, I’m up for the fight. I will kick and scream into the night. I will keep my eyes fixed on the light. See my expression but, not see my fear. My I find those who suffer, may we all stand as one. And may this damn illness not burn out my fun. All I ask is a moment, when life feels the same. As I longingly recall, when I knew not this pain. My Faith will protect me, my friends will be there. And we will share with each other, how we all care. I will look in this mirror, and change things around. Amidst all this pain, no despair shall be found. And that in itself will keep my hope free. Douglas W. Koehler ©2014 All Rights Reserved. For I’m rather fond of you! and originally shared on The Mighty. spite of hyperhidrosis, must I? But I do. causes my pores to flow, ironic I know! my hand finds the railing where it grabs hold. my mind departs and travels abroad. as it travels to destinations within reach. I give in to the deluge. why did I delay this for so long? For the shortest minutes, I’ve vacated a Fibro life. and the moment is passed. you have me if you wanted to get wet! I do not recognise myself standing in the many shadows of you. You, towering, all-consuming, ever present but hidden away,in plain sight. Yet I feel you in every part of me. Trying to become me. Not all monsters lurk like you. Until I am finally broken. Your crack lines emerge in places impossible. From earthen shell to the soul and heartland of me. Breaking, smashing, pillaging anything and everything, until I am nothing of my former self; nothing of possible Me(s). But even broken things can be beautiful. With floods of tears and streams of blood I shall, I shall put me back together again. I emerge not the ‘Me’ that once was, was to be or had been imagined with dreams for the future. I rise as someone, something else entirely–Pained but persevering. Flawed but fluid. Broken but beautiful and believing that I shall conquer. I am and will be the ‘Me’ that never was imagined. I am the ‘Me’ that’s emerged from the ashes of pain. I will not fit your cardboard cutouts or your nicely stencilled stereotypes. To survive, I change. Constantly. As the monster morphs so will I – imperfect still, but ready to give bloody hell in all battles to come. To love is human. To feel pain is human. Yet to still love despite the pain is pure angel. 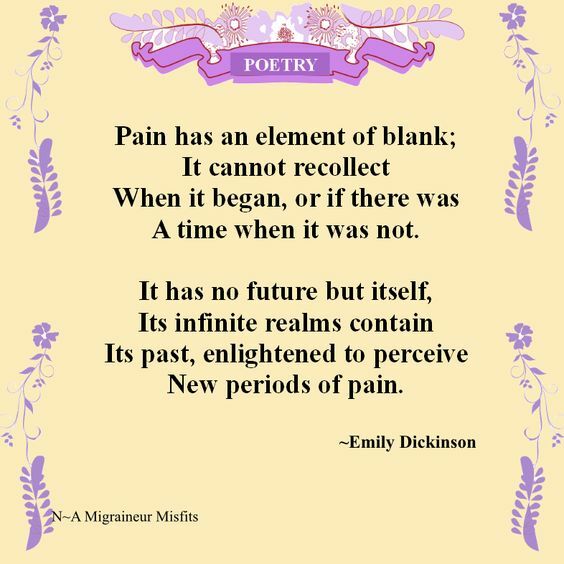 Have you written a pain poem? Why not add the link here in comments so it can be included here. It's also a great idea for a heartfelt unique post. Experiencing mild brain disturbance (fog): I can't remember. I found another poem about pain that I wanted to share. 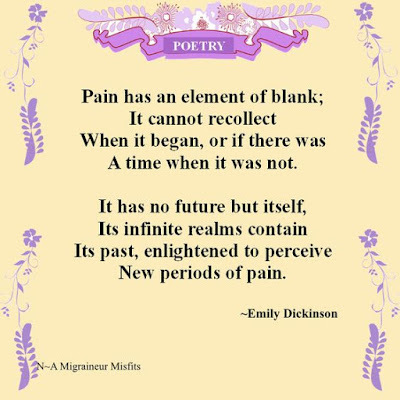 It's by Emily Dickinson and I think it's great. Thanks for visiting and commenting too. We understand anonymous comments here. 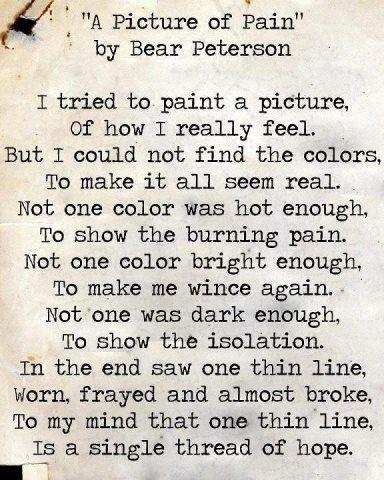 I found another poem about chronic pain that I wanted to share. It's called "A Picture of Pain" by Bear Peterson. I really like it. Thanks so much for sharing the poems with us. That's an interesting find. I can just imagine how you felt when you looked around and saw it there. Enthusiasm for writing poetry always shines through. I haven't been writing a lot of poetry over the last month and have been sticking more to prose. However I did write one about a week ago that was in response to something someone else shared about how they felt about a good day. Someone said that inspiration for poetry can be found everywhere and they're right. Thank you Douglas for your poem which I have now included in the article above. 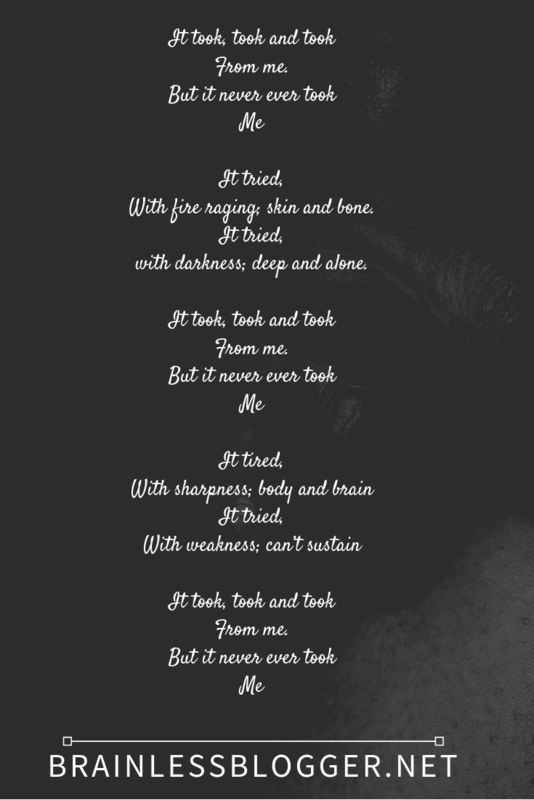 I wrote a poem to Fibromyalgia in a form I call a "power poem." Thanks so much Kim I will have a read. Thanks so much Nikki, I will add it. Here is the link to my poem. If interested I also have one on Depression. Thanks so much for contributing fibromomblog. No need for an apology Alisha, we all understand and are glad to add your poem now.